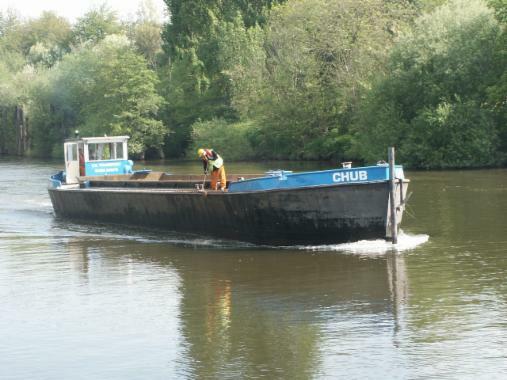 Thompson River Transport was founded in 1990 when our families interest in the River Severn expanded from Inland Cruise vessels to the maintenance and furture development of the River Severn Navigation. 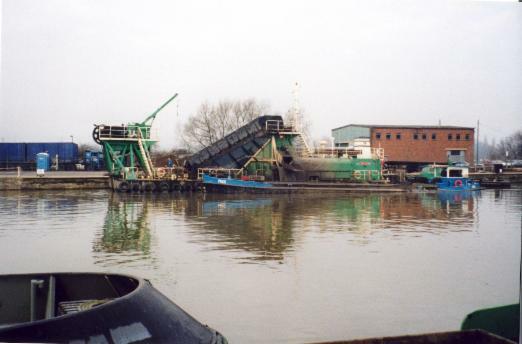 During the 1990's TRT have been involved with British Waterways in the Dredging of the Sharpness Canal and Gloucester Docks. 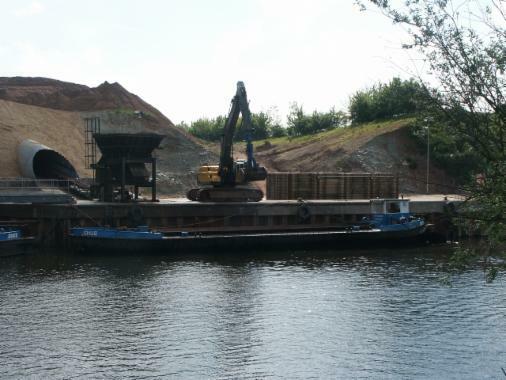 British Waterways changed their method of dredging in the late 1990's and employed a Company from Holland to carry out Injection Dredging which reduced the amount of labour and also the impact Dredging had on the navigation. During this period TRT had been in discussions with Cemex(formly RMC) to transport raw material from its quarry at Ripple to its batching plant at Ryall some 2 miles upstream. 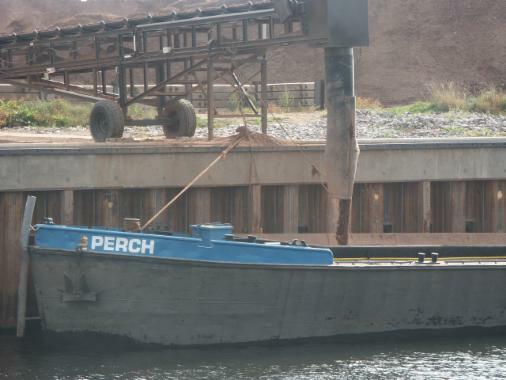 In Febuary 2004 the barges PERCH and CHUB started bringing around 170 tonne loads to Ryall to be processed,averaging around 4 loads per day each. The barges are loaded by conveyor at Ripple which takes around 30mins. Discharge is carried out by a 50 tonne Excavator at Ryall which feeds a hopper connected to a Tele Stacker. During the first 2 years of operation some 400,000 tonnes have been moved and it is expected that this year 250,000 tonnes should be transported. Graham and John Thompson are pleased to announce the launch of the new barge "ELVER"
CONVERTED AT RWD DAVIES BOAT YARD AT SAUL JUNCTION .THE ELVER WENT INTO SERVICE DURING NOVEMBER 2008.WITH HER SQUARED OFF STERN THE VESSEL IS ABLE TO LIFT 15 TONNES MORE THAT HER SISTER VESSELS PIKE,PERCH AND CHUB. WE HAVE FITTED A 360HP TURBO CHARGED DAEWOO WHICH PROVIDES ENOUGH POWER TO ENABLE US TO PUSH ANOTHER FULLY LADEN DUMB BARGE (TOTAL 335 TONNES). AFTER MANY YEARS OF HARD WORK IT WAS DECIDED TO RE-ENGINE THE HOPPER BARGE PERCH.AT THE SAME TIME IT WAS PLANNED TO FIT A NEW SHAFT.PROP,GEARBOX,GENERATOR,STEERING AND WHEELHOUSE.